Walter James Frost (1891 – 1938) was born in Peterborough, Northamptonshire in January 1891. His parents were Joseph Frost (1856 – 1908) and Mary Ann Hall (1858 -). Walter James was baptised on 29th March 1891 in St Peters Church in Peterborough. On the 1891 Census, Water James, aged three months was living with his parents and three older siblings at 6 Bamber Street in Peterborough. His father was employed as a goods train guard. On the 1901 Census, the family had moved to 23 Mayor’s Walk in Peterborough. This road runs over the east coast main line, where his father would have worked. The east coast line had been opened in 1850 by the Great Northern Railway. During WW1, Peterborough was an important point on the railway network for marshalling troops and war material. In 1908, his father had died, and Walter James aged seventeen joined the Territorial Force. His service number was 4032 in the Royal Field Artillery. His unit was the Northants, 4th Brigade Field Artillery Eastern Division. When the Volunteer Force was subsumed into the new Territorial Force as part of the Haldane reforms of 1908, the bulk of the 1st Volunteer Battalion became the 4th Battalion Northamptonshire Regiment, but the two Peterborough companies were converted to form the Northamptonshire Battery of the Royal Field Artillery. The Northamptonshire Battery was based at the Drill Hall, Queen’s Street, Peterborough, and became popularly known as the Peterborough Battery or Peterborough Artillery. Between, 1908 and 1911, Walter had training at Shoeburyness, Lydd and Thetford. On the 29th May 1912 he finished his first period of service in the Territorials. On the 1911 Census, Walter was living with his widowed mother and siblings on Williamson Street in Peterborough. Walter was twenty years of age and was working as a house painter. On Christmas day, 1913, Walter married Dora Sinfield in Swanwick, Derbyshire. They were living at 15 Mayor’s Walk, very close to the old family home. On the 3rd June 1914 Walter rejoined the Territorials for four years. The medical report shows that he was 5 feet 6.5 inches in height and had good eyesight. He left the service after one year. On the 27th June 1916 in Derby Walter joined the Durham Light Infantry, 39th Labour Corps. His address was given as 233 Model Village, Cresswell. He was awarded the British War Medal and Victory Medal for serving in France. His regimental number was 22941. He was discharged on the 2nd January 1919. Between 1913 and 1929, Walter and Dora had six children – Doris Irene, Agnes Dora, Amos Ronald, Douglas Arthur, Joan and Norma. 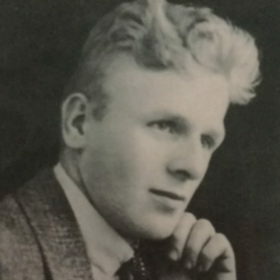 At the time of the disaster on 10th May 1938, Walter and his family were living at 1 The View, Poolsbrook and Walter was working as a Contractor. He was buried in Staveley Cemetery on the 14th May 1938.